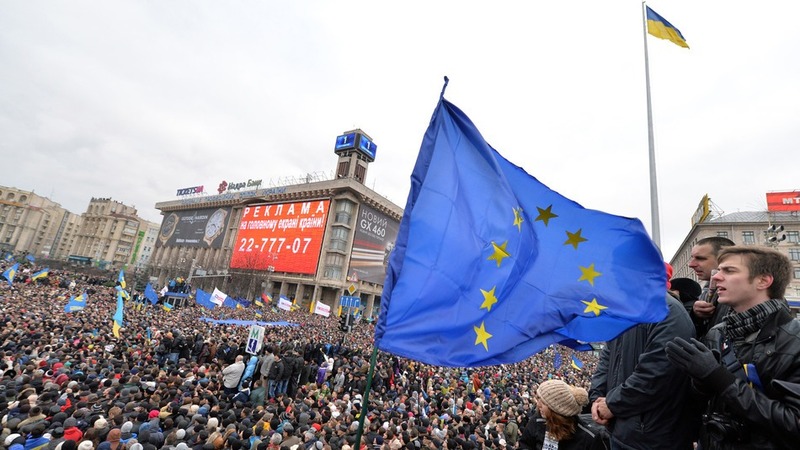 The EU flag in Kiev, as the Ukraine society argue over a Western or Eastern path for the future. Ukraine was known as “Kievan Rus” (from which Russia is a derivative) up until the 16th century. In the 9th century, Kiev was the major political and cultural center in eastern Europe. Kievan Rus reached the height of its power in the 10th century and adopted Byzantine Christianity. The Mongol conquest in 1240 ended Kievan power. From the 13th to the 16th century, Kiev was under the influence of Poland and western Europe. The negotiation of the Union of Brest-Litovsk in 1596 divided the Ukrainians into Orthodox and Ukrainian Catholic faithful. In 1654, Ukraine asked the czar of Moscovy for protection against Poland, and the Treaty of Pereyasav signed that year recognized the suzerainty of Moscow. The agreement was interpreted by Moscow as an invitation to take over Kiev, and the Ukrainian state was eventually absorbed into the Russian Empire. After the Russian Revolution, Ukraine declared its independence from Russia on Jan. 28, 1918, and several years of warfare ensued with several groups. The Red Army finally was victorious over Kiev, and in 1920 Ukraine became a Soviet republic. In 1922, Ukraine became one of the founders of the Union of Soviet Socialist Republics. In the 1930s, the Soviet government’s enforcement of collectivization met with peasant resistance, which in turn prompted the confiscation of grain from Ukrainian farmers by Soviet authorities; the resulting famine took an estimated 5 million lives. Ukraine was one of the most devastated Soviet republics after World War II. (For details on World War II, see Headline History, World War II.) On April 26, 1986, the nation’s nuclear power plant at Chernobyl was the site of the world’s worst nuclear accident. On Oct. 29, 1991, the Ukrainian parliament voted to shut down the reactor within two years’ time and asked for international assistance in dismantling it. As the year 2012 ends, and we wonder what 2013 will bring, UN DESA launch a preview into their “World Economic Situation and Prospects 2013”. Being at a crossroad new even to scientists and economic specialists, it has never been more difficult to predict next year’s outcome. Growth of the world economy has weakened considerably during 2012 and is expected to remain subdued in the coming two years, according to the World Economic Situation and Prospects 2013 (WESP), published yesterday by the United Nations. The global economy is expected to grow at 2.4 per cent in 2013 and 3.2 per cent in 2014 a significant downgrade from the UN’s forecast of half a year ago. Globalization4U brings you a preview into the report her. This year, 2012, marks 40 years since the normalization of a diplomatic relationship between China and Japan. But it is a fragile relationship. This we have experienced the last weeks. Senkakus Islands, a metaphor for a much more serious divide between China and Japan. To understand the underlying sentiments of this conflict is fundamental for the whole world, as we see a China gaining self confidence and claiming their voice to be heard globally. Weather it is the control of some insignificant islands, or to protest against an insignificant country handing out a peace price, there are much more important underlying issues at stake. To move with the current, or against it? The balance of following the crowd, vs moving against the current is sometimes a delicate one. We need both strategies in our repertoire. Why Has Globalization Led to Bigger Cities? 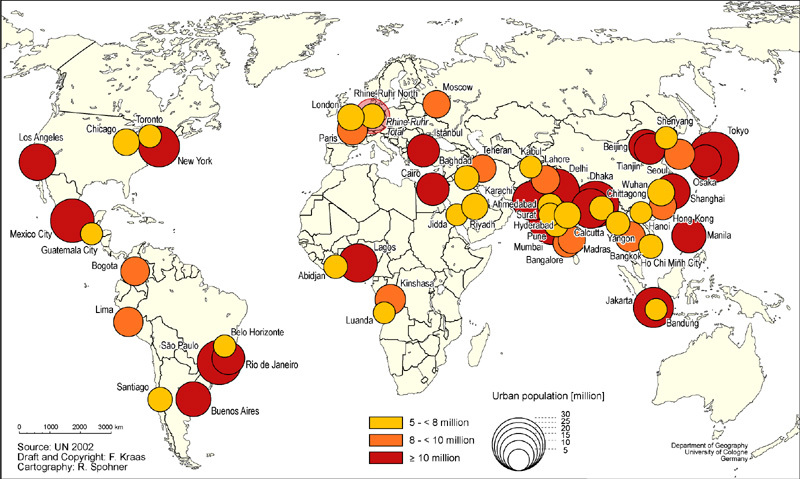 UN map showing megacities of 5.0 million plus. If the world is so flat, then why are cities growing so quickly, especially in the third world? One might have thought that striking declines in the costs of shipping goods and communicating knowledge across space would have led to a great dispersal of population. After all, it is at least technically possible to telecommute over great distances. Yet the share of the world living in urbanized areas increased from 40.9 percent in 1985 to more than 50 percent today. In the developing world, urbanization has often taken the form of exploding populations in megacities. Mumbai’s population increased to 19 million in 2007 from 10.8 million in 1985. Bangalore, the urban symbol of the flat world, has had its population double over two decades, to 6.8 million today from 3.4 million in 1985. The growth of these cities and the continuing strength of older urban areas — like New York, London and Paris — is no accident. 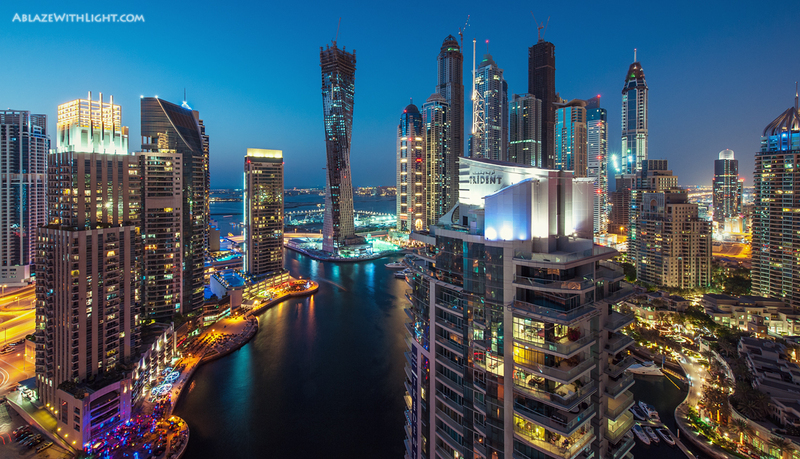 Globalization and new technologies attract people to big cities, by increasing the returns to urban proximity. While it would be technically possible to sit and write software somewhere in the Vale of Kashmir (at least if you didn’t mind the bullets), the innovators in Indian information technology cluster around one another in Bangalore. America’s computer wizards likewise choose to cluster in Silicon Valley rather than disperse. Why has information technology led to urban concentration rather than a great programmer diaspora? Globalization and technological change have increased the returns to being smart; human beings are a social species that get smart by hanging around smart people. A programmer could work in the foothills of the Himalayas, but that programmer wouldn’t learn much. If she came to Bangalore, then she would figure out what skills were more valuable, and what companies were growing, and which venture capitalists were open to new ideas in her field. The information flows that come from proximity might also help to build the relationships that would enable her to create her own start-up. A remarkable number of information-technology start-ups in India were formed by partners who connected in Bangalore. Knowledge moves more quickly at close quarters, and as a result, cities are often the gateways between continents and civilizations. More than 2,500 years ago, the knowledge of the Mediterranean world made its way to Greece through Athens. Twelve hundred years later, Greek and Indian knowledge entered the Islamic world through the Abbasid Caliphate’s House of Wisdom in Baghdad. Eastern wisdom came west again, through Venice and the cities of Spain. The circle continues today, as Western technology makes its way east, again through urban portals like Bangalore. Since there is so much for developing countries to gain economically by integrating with the developed world, the urban gateways to the West attract millions. There is a great deal of concern today about whether the megacities of Asia are just too big. But there is no future in rural poverty. Nehru, in his response to Gandhi, had it right: “a village, normally speaking, is backward intellectually and culturally and no progress can be made from a backward environment.” The slums of Mumbai attract hundreds of thousands of migrants because they offer more hope than the static, backward-looking world of rural India. The millions of poor people who choose to live in Mumbai, and Bangalore, reflect the strength of these cities, which offer economic opportunity not found in Gandhi’s beloved villages. The right response to the problems of megacities is not to get misty-eyed about village life, but rather to work to improve the quality of infrastructure in those growing urban areas. Abundant land hides many sins, including the failures of government. But when people crowd into cities, the costs of governmental failure become painful and obvious. The great challenge facing the growing cities of India is whether the public sector can take the difficult steps that would lead to clean water, better toilets, faster commutes and less crime. Restricting the growth of India’s cities would mean restricting the economic progress of India’s economy, and that would be a mistake. A better path is to figure out how to make those cities more livable even as they continue to grow. A new bank to be evaluated before they meet again in Russia later this year is one of the true evidences of a changing power map in the world. Ambitious countries in “G5” making up the acronym BRICS have concluded yet another interesting meeting in New Delhi. 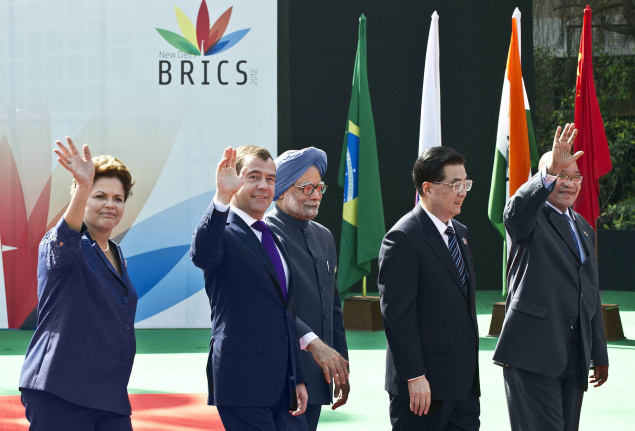 Heads of the BRICS countries (L to R) President Dilma Rousseff of Brazil, Russian President Dimitry Medvedev, Indian Prime Minister Manmohan Singh, Chinese President Hu Jintao and President Jacob Zuma of South Africa. Coordinated efforts within G-20 meeting, regional development funds of their own, more coordinated efforts within WTO are among other issues covered in their agenda. This forum is taking more and more shape, gaining political momentum on the world scene and taking decisions we all have to relate to one way or another. When will we start paying or receiving in brics? They are true bricklayers. Anders, from a very warm spring in Norway. The Hindu : News / National : BRICS focusses on economic, development issues. China’s long march towards global responsibility? 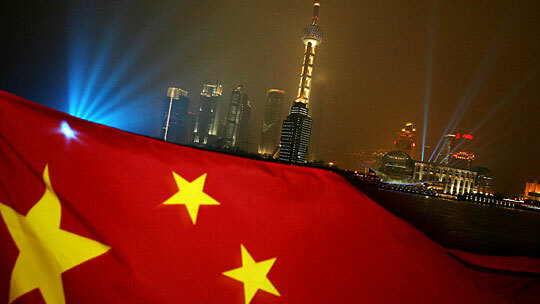 There are positive signs that China is moving forward towards greater global responsibility. Premier Wen Jiabao offered co-operation to help stabilise debt-ridden EU nations, and Zhou Xiaochuan of China’s Central Bank went even further in confirming Chinese participation in a EU bailout fund. There has been immediate response on stock exchanges throughout the world. In a broader perspective, this is a positive signal that China has discovered their interdependency with their global trading partners. But there has never been anything like a free lunch, so what are the terms for this participation? By evaluating the terms, we can judge China’s real view on global responsibility. Anders, from a sunny lakeside Mjøsa. An extraordinary city in southern China is testing this great country’s ability to deal with democratization. 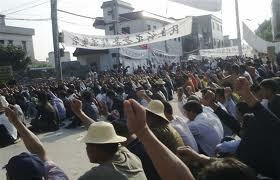 Wukan, a fishing village of approx 20,000 inhabitants have been robbed of their land. Industrial development need more land and local government confiscate land without proper compensation. Protest have been going on for days, local politicians have fled town and police has sieged the city blocking food supplies. This situation is delicate for Chinese officials dealing with both national and international reactions. We should all follow their actions.